String art technique appeared for the first time around the middle of last century, but it became very popular in the late 70’s. The whole idea was to have some fun and creative way to spend some time – it’s also very easy to teach your kids to do string art. Once made the string art project could be put on a wall for extra home decoration – like in the kitchen or living room. One of the main advantages of this type of crafting is that it doesn’t need a lot of materials and preparation. Most of the supplies are easy to be found and very cheap. So let’s see the what exactly do you need to start right away. Yarn – you can go with thicker yarn for maximum contrast of the countour. There are plenty of colors to choos from, but it also depends on the pattern. For example a strawberry template is made of red and green, but you can always be more creative and choose your own color scheme. ·String art pattern – if you can’t draw one by yourself, you can download a free template from the web. You can download some free printable string art patterns at Décor Home Ideas website. 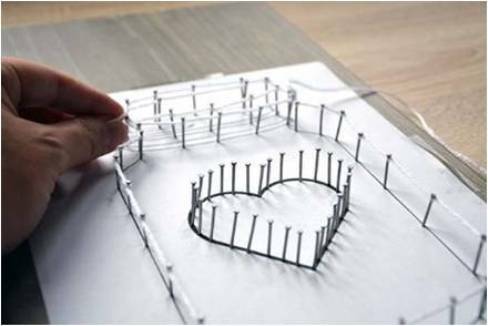 If you are not experienced in the string art crafting, try some easy shapes – like letters and hearts. Figures such as balls, sun and Christmas trees, are an ideal starter project. If you are a fan of the word string art, my advice is to choose a bigger font so each letter has at least 2 tracks for the nails. The most difficult part of the process of making a string art is to get a wood board in the right size you need it and then stain it! Best option is to buy one that is already sized. There is also an option to buy ready made string art kits, but they are more expensive. Always use tape to attach the pattern on the board while hammering. After you hammered all the nails, remove the paper template, because, afterward, when the thread is strung, it would be almost impossible. Knot (secure) the string onto the first nail and start working from there.This is made to prevent the string to untie. To thread the string, just take your thread and make one circle around each nail as you go. There are various ways to approach stringing the inside of your art piece. You can be highly systematic and string the thread in a model or pattern, or you can be a bit more creative and string the thread around randomly – in both ways it will turn out beautiful. ·Don’t pull the string too tight as you go or your nails will start to lean in and may rise out( you don’t need to hammer the nails very hard ). Just pull the thread snug, but not hard. So do you find it hard or easy? Are you planning on crafting your own string art project during the holidays or the summer break? Try it out and you’ll see it is easy and enjoyable.